RXinsider�s Pharmacy B2B ECOSYSTEM supports pharmacy decision-makers by providing a variety of multimedia resources enabling them to efficiently research and connect with leading product and service providers. 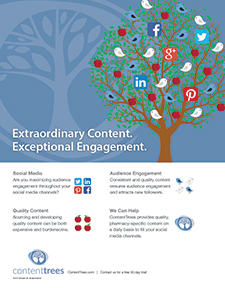 Do you need to reach Hospital Directors? Independent Owners? Chain Executives? Industry Executives? Everyone's talking about the Pharmacy B2B ECOSYSTEM! I enjoy receiving and reading the 20Ways publication. I often tear out and save product profiles that may be of use to our pharmacy. Keep it coming! 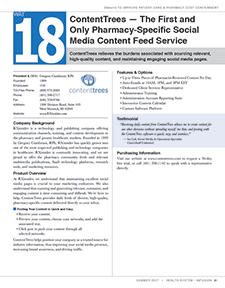 ContentTrees relieves the burdens associated with sourcing relevant, high-quality content, and maintaining engaging social media pages.